All of the films in this incredible fantasy/adventure film series were based upon adaptations of the J. K. Rowling books. The first film was based upon Rowling's 1997 novel Harry Potter and the Philosopher's Stone. With tie-ins to the best-selling series of children's books, after the rights to the books were purchased in 1997 (the first four books were available before the first screen adaptation), the films were guaranteed a built-in fan base (of youth and adults alike). The seven-book series has sold about 450 million copies worldwide ($400 million worth) and has been translated into 67 languages. The last four books set records as the fastest-selling books in history. The imaginative books revived for young people the simple joy of reading, and ingrained the stories in global popular culture. 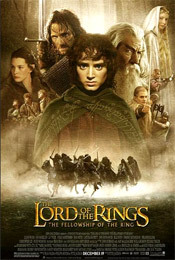 With a production budget of $125 million, its box-office was immense, $317.5 million (domestic) and $975 million (worldwide), and it was the highest grossing film of 2001, just surpassing The Lord of the Rings: The Fellowship of the Ring (2001) at $313 million. 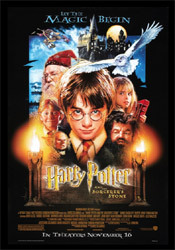 Harry Potter and the Sorcerer's Stone (2001) was finally surpassed as the single, # 1 highest (domestic) grossing film of the franchise by the last film, Harry Potter and the Deathly Hallows, Part 2 (2011). The Potter films revived the once lost genre of children's fantasy, with three young unknowns in the leads who played their roles throughout the entire series. The film series solidified the idea that multi-movie franchises should have the same basic cast - much different from the pattern followed by other major franchises (the James Bond films, the Star Wars films, etc.). The three main cast members were joined by a variety of talented and fascinating supporting characters, innovative visual effects, and great production design. There have been many attempts to capitalize on the series' success - with other copycats and wannabees. In all of the Harry Potter films, the title character - orphaned, bespectacled Harry Potter (Daniel Radcliffe) with a lightning bolt-shaped scar on his forehead, battled against darkly evil cruel wizard Lord Voldemort (played by various characters in the films, although usually Ralph Fiennes) or He-Who-Must-Not-Be-Named, who had killed Harry's parents. It was a classic tale of good vs. evil. This film became the foundation for the same literature-to-screen adaptations pattern followed by other fantasy book series: including The Lord of the Rings, Twilight and The Hunger Games franchises. Other extended film franchises have followed Potter's lead by splitting the original literary source into installments (Harry Potter and the Deathly Hallows, Parts 1 and 2): Peter Jackson's The Hobbit, The Hunger Games: Mockingjay: Parts 1 and 2, and Twilight: Breaking Dawn, Parts 1 and 2. Billions in revenue were generated by merchandising deals (books, shirts, posters, toys, games, and much more). In fact, the franchise has taken in an average of nearly $1 billion every year for more than a decade. The film series became the basis for Universal Studios' theme park attraction. Some have suggested that J.K. Rowling’s adapted filmic tales influenced and shaped the political views of the millennials - a generation of book-reading, faithful film-attending Potter fans who developed greater tolerance and acceptance of personal differences, less authoritarianism, anti-violence sentiments, and more support for equality. Peter Jackson's successful fantasy adventure-epic about witches and wizards - The Lord of the Rings: The Fellowship of the Ring (2001) - the first of three films - was derived from J.R.R. Tolkien's fantasy tale of Middle Earth with Hobbits, dwarves, and elves. Jackson would go on to complete a nine-hour trilogy in the next few years, with two more films: The Lord of the Rings: The Two Towers (2002), and The Lord of the Rings: The Return of the King (2003). It was the new generation's epic fantasy trilogy, a new 'Star Wars' for an entire new group of movie-goers and film-makers. Fantasy films in the past, such as The Dark Crystal (1982), The NeverEnding Story (1984), and Labyrinth (1986) were mostly youth-oriented and only on a small scale. The LOTR films were epic - they created a new interest in the fantasy film genre, especially after the series won so many Academy Awards. In total, the three films won 17 out of 30 total Academy Award nominations. The final film in the trilogy, The Return of the King (2003), won an unprecedented eleven Oscars - all of the awards for it was nominated. It became only the second sequel to win the Oscar for Best Picture. Fantasy content would afterwards be taken more seriously as big-screen epic entertainment, and not regarded as solely for children or for animated films. Each film in the trilogy garnered more support - and also led to a whole new offshoot. A three part trilogy of Hobbit films (from 2012-2014), adapted from J.R.R. Tolkien's beloved 1937 fantasy novel, was created as a prequel - set decades before the events of The Lord of the Rings trilogy. The first film was a tremendous gamble by director Peter Jackson, and its massive scale, non-linear story and sprawling scope were considered unfilmable. Back in the year 2000, it was risky for studios to fund more than one movie - fearing that the first one might flop. As a money-saving gesture, Jackson filmed the entire LOTR story as one film over 16 months in New Zealand - then divided it into three installments. This strategy transformed long-term franchise planning. Simultaneous movie productions and commitments to multi-movie deals became more commonplace. Similar future fantasy literary works would be optioned and planned, such as The Hunger Games, Twilight, and even HBO's Game of Thrones (cable tv), etc. The films blended revolutionary, state-of-the-art computer animation (i.e., the incredibly realistic digital movie character of Gollum created by motion-capture), computer-controlled cameras, visual effects, visual trickery, prosthetics and very large, highly-detailed miniature models (known as bigatures) to create an immersive vision of Middle Earth. The Weta Workshop in New Zealand produced many of the sets, costumes, armor, weapons, creatures and miniatures. CGI motion-capture performances, following Andy Serkis' remarkable portrayal of the virtual character of Gollum, included Caesar in Rise of the Planet of the Apes (2011) (coincidentally also played by Andy Serkis), and the Hulk in The Avengers (2012). Jar Jar Binks in Star Wars: Episode I - The Phantom Menace (1999) was not even in the same league. For the huge battle scenes in The Lord of the Rings trilogy, the filmmakers created MASSIVE, an AI computer program that generated crowds of artificially intelligent (CGI) customizable characters that could be programmed with specific sets of actions - producing more realism for the body movements of thousands of men, horses, Orcs and other combatants. Beyond the theatrical cinematic experience, the original trilogy was made available as an Extended Edition on DVD, with all the formerly-deleted scenes remaining intact - for a full vision of Tokien's entire work. Its extensive multi-disc box-set with 'making-of' featurettes, and 26 hours of additional footage, set a major benchmark for home video box-sets. As a result of the franchise's popularity and importance to New Zealand, tourism to the country increased. Air New Zealand had two Airbus A320 jets decorated in a Tolkienesque theme, and their safety video was Middle Earth-themed. Iconoclastic, sardonic, independent film-maker/journalist Michael Moore has had varied success with his personally-made films about the excesses and abuses of corporate America, social issues and politics. 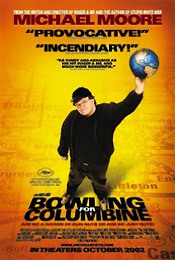 Moore's Bowling for Columbine (2002), the Best Documentary Feature Academy Award-winner, presented the US' trigger-happy obsession with gun rights, violence and the high US crime rate, the US as an aggressor nation, institutionalized violence, and the American culture of fear. The film was the first documentary to compete in the Cannes Film Festival's main competition in 46 years, and was the unanimous winner of the festival's 55th Anniversary Prize. It was also the first documentary film to be nominated and then win the Writers Guild of America (WGA) Award for Best Original Screenplay in 2003. It was also the highest-grossing documentary of all time, soon to be surpassed by Moore's own Fahrenheit 9/11 (2004). Activist documentarian Michael Moore's film contained interviews with pro-gun advocates, including a bizarre James Nichols and members of the Michigan Militia (who counted Terry Nichols and Timothy McVeigh of the Oklahoma bombings as members). It also included a remarkable interview with NRA spokesman/actor Charlton Heston at his home, who expressed his pro-gun position only a few weeks after the Columbine (Littleton, Colorado) HS shooting in April, 1999. Co-producer, co-writer, and director Mel Gibson's R-rated, self-financed, independent smash-hit film, a brutal and ultra-violent, blood-soaked depiction (or reinterpretation) of Jesus' last 12 hours on Earth, stirred up considerable controversy. The much-debated, controversial work was filmed with dialogue in three languages (Aramaic, Hebrew, and Latin) - with subtitles. Although Gibson claimed that the account was authentic and 'truthful' - it would be nearly impossible to derive a strict and true historical account of the events from the Gospels. The film went on to be the most successful and profitable R-rated film ever, with $370 million US box-office (domestic) receipts (on a budget of $30 million), mostly due to its embracing by evangelical church groups and many faithful Christian believers. Many audiences thought they were watching an accurately-portrayed vision of Jesus' (Jim Caviezel) final hours with its visceral horrors of flagellation, torture and crucifixion. It told of the agonizing, unsparing crucifixion death of "Jesus Nazareth/ King of the Jews" on the cross. He was first severely beaten, forced to carry part-way his own wooden cross to the hillside of Golgotha outside Jerusalem, and then was nailed to the cross to suffer and die. The scenes were visceral, horrific to watch, and brutal, although artfully portrayed with gorgeous cinematography and slow-motion ( in part). It set a number of records: (1) the highest-grossing independent film of all time, (2) a record number of pre-ticket sales, more than any other film in history, (3) the highest-grossing R-rated film of all time, (4) the highest-grossing (domestic) foreign-language film and/or subtitled film in history, and (5) the highest-grossing (worldwide and domestic) religious (Christian) film of all time. 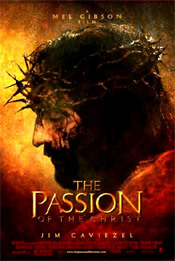 Due to intense criticism over its excessively graphic scenes, an unrated, re-edited re-release of the film (still R-rated), named The Passion Recut (2005), with Gibson's own edits (removal of about 5-6 minutes of graphic violence, and toned down scenes of the grisly acts of torture) was released and shown in theatres for a short time in 2005. The scourging (a 10-minute sequence) and crucifixion scenes in particular were overpoweringly graphic, bloody, torturous and vicious. Even Gibson admitted that the film was deliberately "shocking" and "extreme" in order to depict Jesus' enormous sacrifice. Even before it was released and viewed, religious leaders were indignant over its Catholic-tinged interpretation of the Bible, its use of extra-Biblical sources, and its poetic license, and Jews protested the film as anti-Semitic - believing that the "obscene" film would blame Jews for the death of Jesus. Gibson had difficulty securing a distributor for his film. Visionary director James Cameron's monumental work (his first feature film since Titanic (1997)) was this futuristic, epic, science-fiction/fantasy 3-D live-action film, with ground-breaking, Oscar-winning special effects. It was the first Best Picture nominee to be entirely filmed using stereoscopic 3-D technology. Reportedly budgeted at over $300M, the technically-ambitious film was ballyhooed for its incredible visual effects and 3D IMAX presentation. Much of the visual effects masterpiece's reported budget of over $300 million was spent on CGI. (40% of the film was live-action, while 60% was photo-realistic CGI). The highest grossing film of all time at $760 million (domestic), surpassing his own Titanic (1997) at $659 million (domestic), Cameron became the director of the two biggest movies in film history. It also became the first film to gross more than $2 billion (its worldwide revenue total was $2.8 billion). The 20th Century Fox blockbuster spectacle (a 'must-see' film) had nine nominations, with three technical wins for Best Art Direction, Best Cinematography, and Best Visual Effects (unusual for a science-fiction film). Remarkably, this was Cameron's first narrative film since Titanic (1997), which had a record 14 nominations and 11 wins. 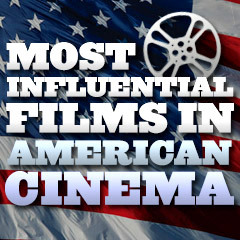 No director had ever attained a total of 23 total nominations in consecutive non-documentary feature films. Although originally scheduled for release in late spring of 2009, the opening was delayed until mid-December 2009, due to the demands of the special effects, and the installation of 3-D projection systems to accommodate the film worldwide. It was a futuristic, sci-fi adventure-action story about humans invading a fantastic planet inhabited by blue-skinned aliens for its rare radioactive natural resource - unobtanium. Over a period of years, Cameron had designed dual-function cameras that simultaneously filmed in both conventional 2-D and state of the art 3-D. He devised a stereoscopic 'virtual camera' allowing him to move through a 3D terrain during filming. 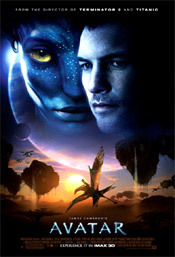 The film also utilized cutting-edge motion performance-capture assisted, photo-realistic CGI technology with actors on a stage (called the Volume), to create the sympathetic Na'vi characters. The technique of performance capture involved putting actors into bodysuits covered with tiny dots, while about 140 digital cameras captured their body movements. Another tiny helmet-rigged camera was used for recording finer facial, eye, and head movements. And then the digitally-recorded data was used by animators to create the characters in their virtual world environment. "Avatar" started a massive wave of studios requesting profitable post-production conversion into 3D for their summer popcorn blockbusters (although the success rate widely varied). The immersive 3D effect brought movies to event-loving audiences, and inflated ticket prices. It has been reported that there are three Avatar sequels, being filmed back-to-back, and first released in 2017.